Accommodations can make or break your North Myrtle Beach vacation. These North Myrtle Beach vacation rentals at Ocean Boulevard Luxury Villas are exquisitely furnished, most spacious for a larger group of people and located close to Myrtle Beach golf, live entertainment theatres, shopping and dining. 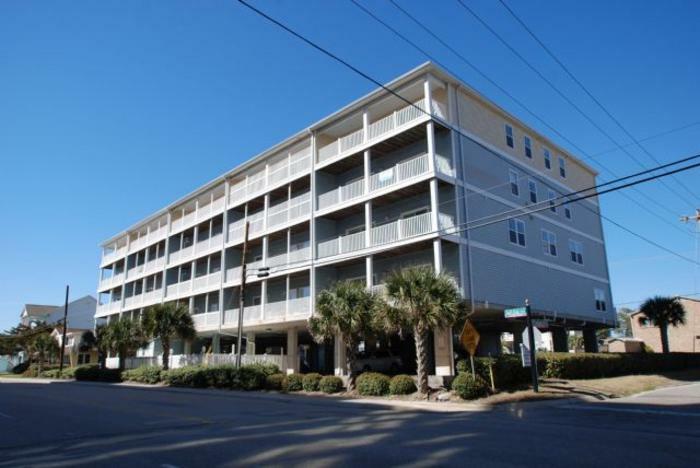 This second-row North Myrtle Beach resort is in the Crescent Beach section of North Myrtle Beach, South Carolina. It is a four-story building on stilts that is right across the street from the Atlantic Ocean and the white sandy beaches. Each of the North Myrtle Beach vacation rentals at Ocean Boulevard Luxury Villas are two stories and feature more than one balcony. Ocean Boulevard Luxury Villas has a swimming pool and hot tub on the ground level. There is also a grill area on site at this North Myrtle Beach resort so you can cookout hamburgers and hot dogs or go for a seafood feast of jumbo shrimp and fresh flounder. Having a summertime barbecue just steps away from the Atlantic Ocean is one memorable way to spend an evening of your North Myrtle Beach vacation at Ocean Boulevard Luxury Villas. The top-of-the-line North Myrtle Beach condominiums at this North Myrtle Beach resort are designed to sleep nearly two dozen people. Reserve the eight-bedroom condo in North Myrtle Beach, SC for your next family reunion, church group outing or golf getaway with a couple of golf foursomes. There are five full baths in these North Myrtle Beach vacation rentals for the convenience of such a large group. The open floor plan of these North Myrtle Beach condominium rentals allows for plenty of furniture to be placed around the living room and dining area to best accommodate a large number of people spending a North Myrtle Beach vacation at Ocean Boulevard Luxury Villas. The kitchens in these North Myrtle Beach condo rentals feature two full-size refrigerators to store all of your drinks and snacks. There is an extra large breakfast bar and a dishwasher makes clean up easy. Many of the bedrooms in these condos in North Myrtle Beach, SC feature balcony access so you can step outside first thing in the morning of your North Myrtle Beach vacation and breathe in some fresh sea air. The balconies at Ocean Boulevard Luxury Villas are ocean view. Furnished so you can relax, these private balconies are a wonderful place to congregate early in the morning during the oceanfront sunrise and also in the evening as the stars come out and light up the sky. Elliott Beach Rentals is not affiliated with onsite management or the HOA of Ocean Blvd Luxury Villas.